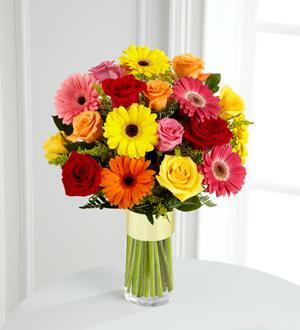 The Pick-Me-Up® Bouquet by FTD® is a beautifully bright and colorful way to spread sunshine and cheer. 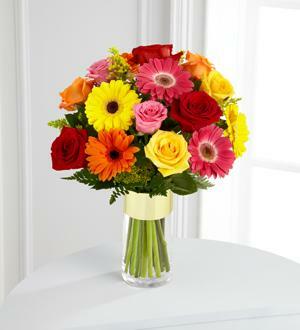 Assorted roses and gerbera daisies in their most brillliant hues create a stunning bouquet accented with yellow solidago and assorted greens. 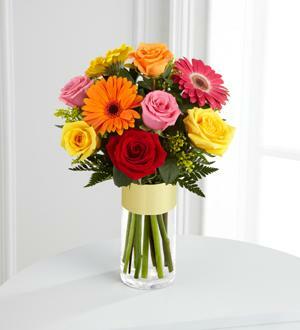 Arriving in a gold banded designer clear glass vase, this bouquet is a sweet way to light up their life. GOOD bouquet includes 9 stems. Approximately 16"H x 11"W.
BETTER bouquet includes 14 stems. Approximately 17"H x 13"W.
BEST bouquet includes 19 stems. Approximately 18"H x 14"W.